We worked with Letter Jacket Envelopes to redesign and develop the core of their business, the envelope customization app. What we came up with was a clean and easy to use interface backed by real user data that integrates directly with their Shopify store. The original application was slightly awkward to navigate, and customers were having trouble successfully completing orders. We had our suspicions as to what the primary issues were, but decided that the best route forward was to back our suspicions up with real customer data. 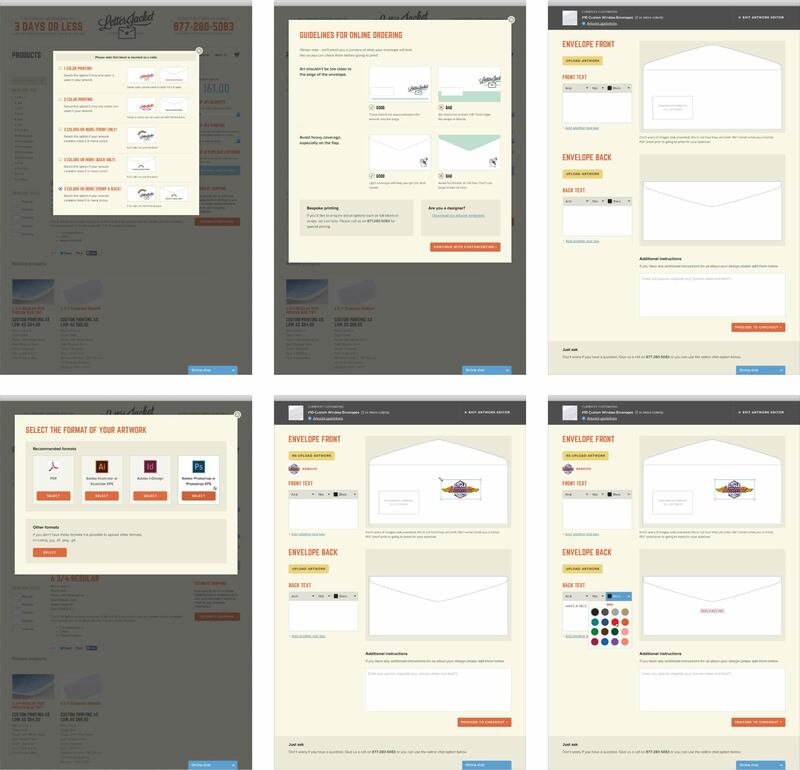 We brought in a handful of potential customers and had them go through the steps of going to the website and customizing an envelope. We gave our test users a set of instructions, some logo files for their ​“business”, and sent them on their way. With this new data, along with the client’s other goals for the redesign, we started prototyping the user journey. After a few rounds of feedback, we were happy with the progress and began polishing the visuals. Meanwhile, we prototyped the functionality of the new application in Sinatra, a tiny Ruby framework. Behind the scenes our platform takes the customers uploaded files, manipulates them into a few different versions, sends them to Amazon S3 and, seconds later, passes back image URLs that we then give to the canvas for further user editing. Once the customer is done creating their envelopes, we create a preview file that gets sent to Amazon S3 as well. The final product is a bulletproof system, designed and engineered from real user data.